The large touch screen on an iPad broadcasts images beautifully and many people are looking for ways to streamline their video projects directly onto this portable iDevice. This objective actually has a lot of options right in the post-production software you may already be using, especially in the high end packages. Here is a look at how to use Apple Compressor as an iPad video converter, as well as some other video conversion programs available. 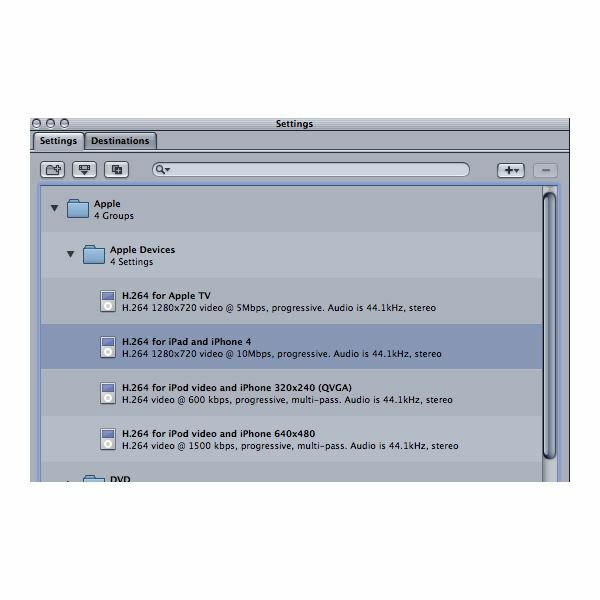 When you are first attempting to use Apple Compressor as an iPad video converter you need to either send your video project to it from Final Cut Pro or open a self contained movie file inside Compressor to start with. Start by going up to Target in the upper task bar, going down to Destination, and then choosing a storage location where you want the compressed file to go to. exactly what you are trying to compress video for. The second option down, below Apple TV, will be "H.264 for iPad and iPhone 4. More specifically this will list it as an "H.264 1280×720 video@10Mbps, progressive. Audio is 44.1kHz, stereo." When you choose Apple Compressor for the iPad you choose from the same codec that you do with the newest iPhone, though they may end up looking different because the devices are different. From here you will drag the "H.264 for iPad and iPhone 4" up to your project's tab above. Now just hit the Submit button in the lower left hand corner of that panel and the compression will begin, exporting the finally converted file for the iPad to the storage location you set for it. Apple Compressor is great for the iPad, but it is by no means the only iPad video converter available. It has always been best known because it created a category for Apple Devices right from the start, mainly because it is made by Apple for Macs exclusively. Alternatively, there are a number of other great video conversion programs that you can use to compress for the iPad. If you just want a simple and free iPad converter then you can go directly to Videora, which is a streamlined software just for the conversion needed for these iDevices. The program may be bare bones and each one will be specified for the device you need, but if you are working with just your iPad then this will be a great option. The Aleesoft Free iPad Video Converter is a little more involved than Videora, but not by a great deal. This will also allow you to take some control over your project, setting up new compressions as needed, and monitoring it as it takes place. This will work well, along with Videora, if you want to work on compression batches of videos for the iPad when needed. Otherwise you will want to have a full service video conversion program that you can utilize as part of your post-production process.